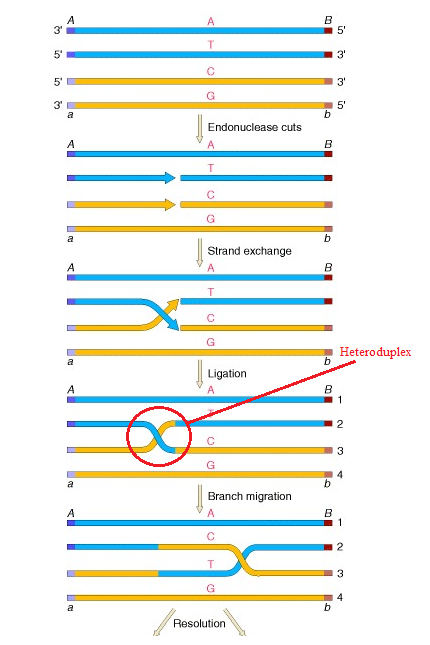 A heteroduplex is a double-stranded (duplex) molecule of nucleic acid originated through the genetic recombination of single complementary strands derived from different sources, such as from different homologous chromosomes or even from different organisms. Should the following highlighted structure be called heteroduplex? What you've circled is not a heteroduplex. A better name for it would be "crossover" or "junction". Instead, the two duplexes at the bottom of your diagram are what should be labeled heteroduplexes. Your diagram shows one process by which you could generate heteroduplexes starting from homoduplexes. The two strands in a heteroduplex still have to have a high degree of sequence identity or they won't be able to form into a duplex in the first place. However, because they come from different sources there's likely to be many short subsequences in which one or more base pair is mismatched, causing a deformation as shown. Not the answer you're looking for? Browse other questions tagged genetics terminology or ask your own question. What is Chronic immobilization stress (CIS)? What is a “scutella of reindeer”? What is the difference between sinew and tendon? What are 'factors' in biology?